Starring: Greg Austin, Fady Elsayed, Sophie Hopkins, Vivian Oparah, Katherine Kelly, with Peter Capaldi as The Doctor. Coal Hill School has now become an academy, and it is some time since popular teacher Clara Oswald became missing, presumed dead. Life at the educational establishment goes on though, and a quartet of remarkable youngsters are attending the academy: Charlie, April, Ram and Tanya. One of these is an aloof and unpredictable young man, another a self-conscious but kind and loyal young lady, another a promising athlete with something of a chip on his shoulder, and the last a brilliant student who has skipped a year and who tells things exactly the way they are. 'The way things are' ..become somewhat surreal, however. A student has suddenly gone missing, and a new teacher - Miss Quill - has joined Coal Hill and acts in the most awkward and unnatural of ways. A shadow creature is beginning to stalk students, and before long a legion of otherworldly beings are stampeding the premises, despite a carefully arrange prom by April. Could this be grounds for the return of Coal Hill's rather eccentric Caretaker?? 2016 will go down in Doctor Who lore as something of a 'gap year'. The first one of these was back in 2009, which featured a number of specials. Since then, other years have been rather light in terms of having new material with the Doctor on TV. Currently, fans are eagerly awaiting Series 10 to materialise onscreen in the spring of 2017. In the meantime, there will be the customary Christmas special. There now is also this particular edition to the wider Who mythos, and somewhat appropriately it is set in the school that was the workplace of the first two human companions of the Doctor - Ian Chesterton and Barbara Wright - before they were whisked away on the most incredible of journeys. Other spin-offs have been part of early evening or prime time TV once modern Doctor Who fully got under way. Torchwood was most deliberately intertwined with the main Who universe, despite its very different target audience. Class falls between the parent show, and Torchwood, in that the 'young adult' is the intended demographic. There is some gore now and again, and sexuality and relationships are given much emphasis - unsurprising, with the show set in an academy, with teenagers on the verge of adulthood. 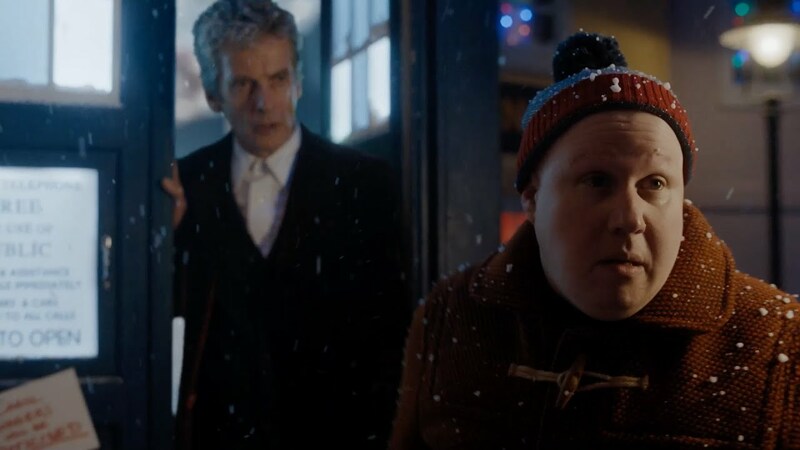 Many fans will have been made aware by press that the Twelfth Doctor would pop up immediately in this maiden run of the new show. However, as it turns out he is used sparingly enough to allow the main protagonists to have their crucial limelight. Having the Doctor teased as being shown in a flash back to explain Quill and Charlie being on Earth in the first place is a wise move, before the eventual crisis point where he pops up in the nick of time to quell the threat posed by the Shadow Kin. Capaldi manages to make the most of his limited screen time and continues to act in the vein of a traditionally open and friendly Doctor, as he did for much of the 2015 TV run. Some of these new characters that viewers will follow in coming weeks are more engaging than others, owing both to the script and to the actual actor. Miss Quill (Katherine Kelly), and April (Sophie Hopkins) definitely stand out best for me, although there is a lot of potential for Charlie (Greg Austin) as well, given his back story. Tanya and Ram do have their moments but sometimes can feel stilted. Fady Elsayed has a substantial enough resume already, but can't overcome the 'jock' clichés enough for him to be particularly remarkable in this first installment. Vivian Oparah shows some of her acting inexperience at times, but still convinces more than not, and should grow into the role under the solid production team involved with the show. Patrick Ness' script is reliable and confident in getting a suitably energetic adventure across, but also affording some good work into making us connect with the characters, and that includes some of the relatives of the students. Ness also wants to keep one guessing, which is always an asset of TV drama. One or two other academy students had the potential to end up as main characters, but are killed off by the Shadow Kin in resounding fashion. And the violence does mean this is not really a show for 'under-12s', with Rachel's gory death, and Ram's horrific leg injury really pushing the envelope. The direction and music - from Ed Bazalgette and Blair Mowat, are similarly assured. Some scenes flash by in heartbeat, but the overall feel of the episode is just coherent enough, that the fast pace is manageable. This season opener has many moments of literal light and shade to explore and the production makes the most of the opportunities afforded. Obviously, the budget is not in the same stratosphere as Doctor Who, and some of the effects with the Shadow Kin or the unearthly dimensions that April or Charlie can see in their mind's eye do require a little tolerance on a given viewer, used to more seamless CGI. Class stands up as a show with a steady foundation and a lot of good will both in front of and behind the camera. It may currently not appear to offer anything truly pioneering, given the likes of Buffy, Misfits and many late afternoon teenage dramas, that have graced TV screens. But it is still a justifiable addition to the Doctor Who canon and has plenty of room to grow into something truly distinct and memorable.